Increase the Size of Your Ad! Skywriting is the first gigantic advertising I remember: mile-high letters at 10,000 feet—telling me to drink Pepsi. (That was impressive, but not as much as fake skywriting. I remember how disappointed I was to learn that the marvelous "Surrender Dorothy" message in the sky above Oz was a special effect.) The most obnoxious big ad I have ever seen was the giant Camel cigarette billboard on Times Square in New York. It featured a guy blowing smoke rings from 1941 to 1966. (Not the same guy. He died.) I have not seen the newer eight-story cylindrical Nasdaq sign (with 8,200 separate panels run from a control room) that wraps around the Condé Nast Building at Broadway and 43rd Street in New York, but I am prepared to be suitably offended by it. Somewhere in the middle of all this is a newer technology that prints computer-generated images on giant rolls of vinyl. You have seen the smaller format images on the backs of buses. From the outside, the picture looks solid; from the inside, however, you can see out; this is especially helpful if you are a driver trying to use the rear-view mirror. The larger format, however, also produces "wallscapes," multi-story images turned out in sections on very large printers and then joined at the seams when they are put up. Unlike hand-painted signs, which can take months to create, wallscapes can be up in a few hours. Such wallscape advertising is common in Naples and, strangely enough, I don't mind it, since it helps pay for a considerable amount of reconstruction of the facades of historic buildings. There is an old wheeze about a window-washer's job never being done on a skyscraper; that is, when you finish, it's time to start over. That goes, as well, for restoring buildings in Naples. At any given time, there are dozens of projects going on in the city to restore the facades of buildings. The jobs range from mundane schools to historic churches to the San Carlo Theater (from 1737). Some of the work is done to repair the ravages of time and some of it is to undo the earthquake damage of 1980. Yet, there is so much to do, that the work is really never done. The trick, however, is to make the work as invisible and as aesthetically pleasing as possible, especially in spots frequented by great numbers of tourists. In the old, pre-wallscape days, you simply put up scaffolding on the facade and draped anonymous green webbing down over the outside of the entire rig in order to keep hammers and chunks of plaster from falling onto unwary noggins below. Now, however, the finished product—the way the facade is going to look some day—is printed onto giant sheets of vinyl and those sheets then become the barrier between the outside world and workers scurrying about the scaffolding. You can ooh and aah at the picture and, then, when the magic day comes, they drop the screen and your oohs and aahs are already in the bank, so to speak. The whole screen is paid for by an advertiser who gets to put an outrageously oversized spot in the middle of the vinyl facade. 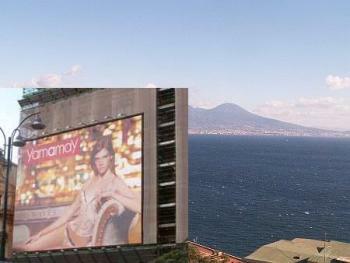 The most noticeable wallscape ad in Naples in recent years was on the west side of the San Carlo theater (photo, above). The make-believe facade looked good, and the ad in the middle changed periodically. There was some speculation that the giant "walk" sign on the Coke ad would confuse tourists; they would stare at the ad and cross the street without noticing that the real traffic light said "Don't Walk." Dead pedestrians were at a minimum, however, since no one pays any attention to those signs in Naples, anyway.